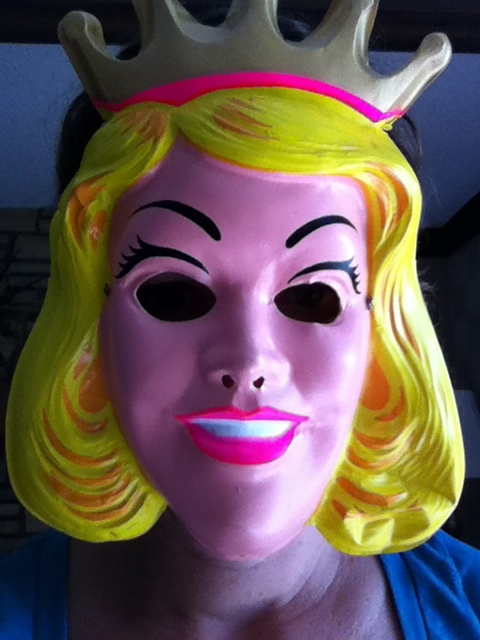 One Cinderella princess mask, circa 1973. Comes with nylon pink and white smock to complete the Cinderella look. Don’t worry, it mostly covers your thick winter coat. Yes, the breathing hole is small, but it does exist (I survived the photo-shoot and only got light-headed twice). Might want to avoid eating onions or garlic before trick-or-treating this year, just to be safe. It gets a little sweaty by the breathing holes, so pack some tissues. This costume is so amazing that not only did I wear it three years in a row, my sister had used it for at least one Halloween before me. All interested buyers must sign a waiver promising not to use this mask in any bank heist or other illegal shenanigans. Scaring family members is not only permitted, it is encouraged. Originally, this gem was sold for $3.99 (likely at Woolco), so no offers under that will be considered. It is recommended that you trick-or-treat with a buddy as there might be one or seven blind spots, so hold off on the scaring of family members until after Halloween (it also makes it that much more unexpected). If you’d rather not be a pretty, pretty princess, might I suggest another option? This is the first in a series of pictorial posts entitled: “Stuff From my Childhood That is Still at my Parents’ House”. We were never allowed to wear a mask. So I had to be a clown more times than I care to mention. I’m pretty sure my mom used diaper rash cream for the white part. Zinc cream would allow you to look creepy, but also irritation-free. Nice call, Mom. I still have my “Donny” costume from the “Donny & Marie” show at my mom’s house. Talk about a creepy mask! And yes, I am a girl – just a nonconformist! 🙂 I might even have the Hollie Hobbie one I wore the next year. My longest run at a costume was a “gypsy” get-up that allowed me to wear my mom’s hippie skirt, bangle jewelry, and heavy makeup. Every item you listed I had or did. I was also a hobo one year. A bearded, pipe-smoking hobo. My folks made my costumes. I was frequently a cardboard box robot. Just add tin foil and you’re golden. Or silver. Whatever. Homemade are the best. Our boys just raid the dress-up bin when October rolls around. How many times are we talking? 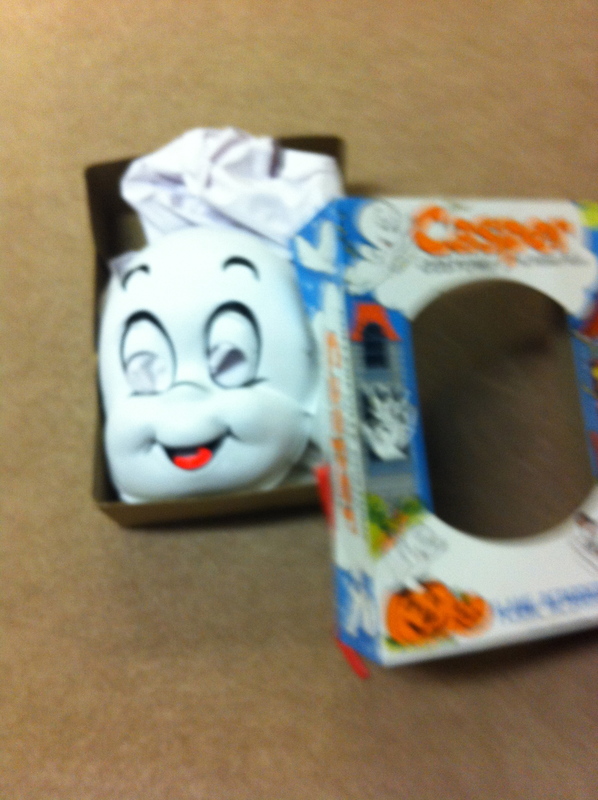 Did you save the box from year to year or did you reboot each Halloween? I think they were rebooted. I doubt boxes would last long with three boys in the house. Sometimes I doubt I’ll last long with four boys in the house. Previous Previous post: Camp Rules!